Infinite Campus Parent Portal allows parents/guardians to access, review, and update information for all their students. Infinite Campus offers secure, real-time data. As soon as attendance, grades, etc. are entered at the school, they will be visible to the parent/guardian. Infinite Campus also allows access to cafeteria account balances and a record of cafeteria purchases for their students. Parents/Guardians can also use the Parent Portal to make payments for your students' textbooks and cafeteria purchases. An activation key is required to create your Infinite Campus Portal account. Please contact your student's school if you need your activation key. Infinite Campus Student Portal will allow students to access and review grades, assignments, attendance, etc. Infinite Campus offers secure, real-time data. Infinite Campus also allows access to cafeteria account balances and a record of cafeteria purchases made. Want more information regarding creating your personal portal account? Danville Community School Corporation has launched an innovative app to keep your children safer and make your morning easier. 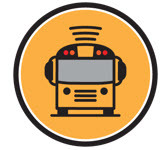 With HereComestheBus, you and your child will receive alerts when the bus is near! The app is FREE to all parents for the school year. Download the HereComestheBus app from the App Store or Google Play. To sign up/activate the app you will need the code 82177. Between 4:00 p.m. and 7:15 a.m., parents may call the South Elementary number 317.745.2131 and follow the prompt to access the Attendance Line or email the office at southoffice@danville.k12.in.us. Please be sure to include the following: your child's name, grade and teacher, date of absence, the reason for the absence, and your name and relationship to the child. If you know your child will have a change of destination, please send a note to the teacher, and call the main office at 317.745.2131 or email southoffice@danville.k12.in.us. If a change comes up during the day, please notify the office prior to 1:30 pm. The tardy bell at South rings at 7:40 a.m. If you do not see a staff member in the back in the car drop off area, it means that the bell has sounded and you will need to come into the front entrance to sign in your child. Parents are reminded that students are not to be dropped off before 7:25 a.m. We do not have staff available to supervise children until 7:25 a.m. NO student may be dropped off early. If you would like your student to walk to or from South Elementary we MUST have a permission slip on file.